With over 2,200 miles of waterways to explore, choosing where to begin a journey of discovery can be a daunting task. What’s more with a 4mph speed limit your progress will be slow. Here we present a guide to the best stretches for beginners. As a beginner the best routes are those unencumbered by many locks, or even feature none at all, so that you can begin your adventure with miles of uninterrupted cruising. Rather than stress you out by bombarding you, a route with a small number of locks will help you to grips with them at a leisurely pace. For this reason the Worcester & Birmingham Canal is best avoided. This is the most heavily locked canal in England, with 58 in total. Over half of these comprise one mammoth flight at Tardebigge, which demands hours of manpower and a steel will. Novices faced with this monolith of engineering will likely be put off canal boating for good. Better options for beginners can be found on such stretches of waterway as the Llangollen Canal, Lancaster Canal or the Ashby Canal. For those keen to avoid locks altogether, travellers down the Lancaster Canal can cruise through its bucolic rolling countryside for over 40 miles without having to contend with a single lock. The Ashby Canal is also noted for its absence of locks. If you are of the disposition that, in being such ingrained part of canal life, it is no use hiding from locks, then the Llangollen Canal is a great option. It offers mostly uninterrupted calm with the occasional lock thrown in to give you some practice, as well as respite from all the awe-inspiring scenery and dramatic architecture, such as the celebrated Chirk and Pontcysyllte aqueducts. However, in being widely hailed as the most beautiful canal in the country, it does get fairly busy during peak season. The whole canal can be covered there and back within in a week, but for a short break the stretch between Whitchurch and Llangollen comes the most highly recommended. The neighbouring Shropshire Union Canal is also a popular choice for beginner boaters, with its remarkably straight course and relative absence of locks. However there are some obstacles worth watching out for, as the locks on this canal are largely concentrated in three rather long lock flights at Tyley, Adderley, and in particular at Audlem. 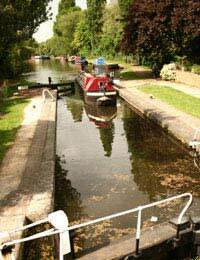 There are two main types of canal journey – the out-and-back and the ring. The out-and-back journeys are the best for novices seeking a straight-forward short break to get them into the swing. These routes just go forward and back the same way and so it’s almost impossible to get lost. This means you can cruise as far – or as little – as you like. The River Thames is particularly popular for out-and-back journeys, with a variety of both countrified and urban sights to marvel at en route. Although it features 44 locks along its length, these are largely all operated by dedicated lock keepers. The gentle non-tidal stretch from Teddington to West London is most recommended for beginners as it offers calm waters and slices of pretty little England in the towns of Marlow, Henley and Windsor. Cruising rings are more restrictive for beginners than out-and-back journeys because these are set routes that take you back to the start through linking canals. Depending on the cruising ring chosen these can take at least a week to complete, and there are no shortcuts back. Cruising rings are better suited to the canal boater who is more confident and ready for a longer break. For those novice boaters who are up for the challenge of a ring then the Four Counties Ring comes recommended, as is it short enough to offer an easy introduction whilst at the same time offering an entertaining mix of varied countryside and city cruising.